Channelling is a process whereby a person allows themselves to become a channel of communication for spiritual entities from beyond the physical realm. In principle it is similar to mediumship, the main difference being that mediums tend to focus on the communication with those recently departed from the physical realm, usually with the purpose of comforting relatives and friends of the deceased. Channelling however is usually communication with entities believed to be more highly spiritually evolved, with the purpose of gaining information for education and spiritual advancement. Although mediumship has been widely practised throughout recorded history, channelling is a relatively new phenomenon in the Western World. 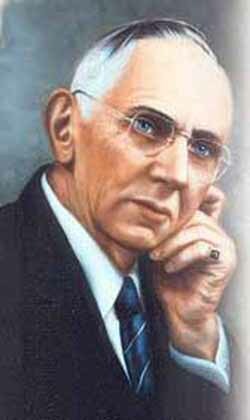 The first widely recognised channeller was Edgar Cayce (pronounced ‘Casey’), sometimes referred to as the ‘sleeping prophet’. Born in Kentucky in 1877, he exhibited psychic traits as a child, but was a devout Christian with a desire to become a preacher. However at the age of 23 he developed laryngitis and was unable to speak above a whisper for several months, such that for a time he gave up hope of ever speaking normally again as doctors and specialists were unable to cure him. He gave up his job as a salesman and began a career in photography. A travelling stage hypnotist called ‘Hart, the Laugh King’ heard about Cayce’s condition and offered to hypnotise him in an attempt to effect a cure. This was done publicly and to the amazement of all Cayce was able to speak normally while hypnotized. Hart several times tried post-hypnotic suggestion that the voice would continue to function after the trance, but the laryngitis returned each time he awoke. Al Layne, a local self-taught hypnotist and osteopath, offered to help. He suggested that Cayce describe the nature of his condition and cure while in a hypnotic trance. Cayce described his problem as a “psychological condition producing a physical effect.” He stated that the condition could be removed by suggesting to him while in the unconscious state that the blood circulation increase to the affected areas. After Layne made the suggestion, the upper part of Cayce’s chest and his throat turned bright red and the skin became warm. Twenty minutes later Edgar spoke again, stating that before Layne awakened him the suggestion should be made that the blood circulation return to normal. Layne followed the instructions. When Cayce came out of the trance, despite being completely unaware of what he had said, he was able to speak normally for the first time in almost a year. Layne himself suffered from a chronic stomach condition, and asked if Cayce would do a reading for his condition. Cayce felt obliged to help, and in the trance state accurately described Layne’s condition and prescribed a cure combining natural medicines, dietary changes and exercise. Within a week Layne felt so much better that he implored Cayce to continue doing readings, arguing that he had a moral obligation to help people. Cayce was wary, having no prior knowledge of medicine and a suspicion of the psychic process due to his religious beliefs. Layne was insistent and after much prayer, Bible reading and consultation with his family, Cayce finally agreed. Word spread and Cayce began to do readings on a regular basis, asking only for donations from those who could afford it. It was discovered that he only needed the name and location of a patient to prescribe a cure, and he began to receive mail requests. He had much success and his fame spread, and he continued to give readings on a regular basis. Even though he was reluctant for a while, his success began to convince him that he had a gift from God. One of his readings stated that whilst in the trance state the conscious mind becomes subjugated to the subconscious, superconscious or soul mind; and communicates with like minds, and the subconscious or soul force becomes universal. From any subconscious mind information may then be obtained. At one point he was persuaded by oil prospectors to give readings on possible oil sites, but these were unsuccessful. The readings stated that the readings were never to be used for financial gain, and he came to the conclusion that he would use his gift only to help the distressed and sick. After over 20 years of giving mainly health related readings, he was asked by Alfred Lammers, a wealthy printer and student of metaphysics, to give a philosophical reading. In the reading he mentioned a past life of Lammers, and upon waking was shocked to hear this, as it conflicted with his religious beliefs. This led him to much soul searching, and in a reading he was advised to read the whole Bible whilst keeping the idea of reincarnation in mind. He came to believe that the idea of reincarnation was not incompatible with Christianity and actually gave him a deeper appreciation of the purpose of life. In 1925 Cayce realised a long held dream, moving to Virginia and setting up a hospital where trained medical staff would treat those he gave readings for. He also began to do ‘life readings’, looking at peoples’ past lives and how that affected them in their present lives. These readings expanded to include mental and spiritual counsel, philosophy, spirituality, meditation, dream interpretation, intuition, history and ancient civilizations, prophecies and relationship advice. In 1931, the Association for Research and Enlightenment (A.R.E. ), was formed as a research body whose goal was to investigate and disseminate the information contained in Cayce’s readings. As his fame as a psychic grew, many skeptics came to Virginia Beach to expose him as a fraud, but in time all were convinced of the legitimacy of what he was doing. Thomas Sugrue, a staunch Catholic, investigated what he thought had to be trickery and ended up writing ‘There is a River’, Cayce’s first biography, published in 1943. Cayce pushed himself to do more and more readings to keep up with the demand, and this began to take a toll on his health. He died in 1945 at the age of 67. It is estimated that he gave over 20,000 readings, although only 14,000 of these remain today. Although he died long before the emergence of the New Age movement he remains a major influence on many of its teachings. These days it is probably his prophecies that get the most attention. Many – though not all – have come true. His readings stated that prophecy is only given as a warning, that the future is not fixed and that human free will makes virtually everything possible. Therefore a successful prophecy is one that has been averted, and is definitely not a sign of a fake, as some skeptics have claimed. I was hesitant to say how aesthetically challenged I believe this Viosin is. But Tom, I totally agree with the Delahaye. I think the admin of this web site is in fact working hard for his web site, since here every material is quality based material. a very smartly written article. I will be sure to bookmark it and return to read more of your useful info. weblog; this blog carries awesome and in fact good data in favor of readers. We prefer to honor many other world wide web internet sites on the internet, even if they arent linked to us, by linking to them. Beneath are some webpages worth checking out.